When Interactive Intelligence introduced its standards-based multichannel software platform for unified business communications and voice over IP (VoIP), it changed the communications industry. Now more than 17 years later, this platform is still revolutionary, and just as versatile, practical and straightforward as first envisioned. 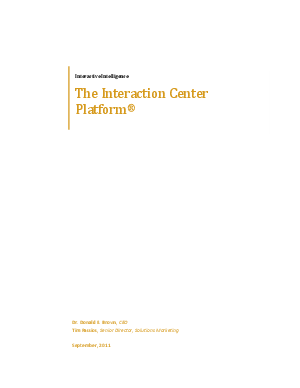 Read what makes the Interaction Center Platform a true-all-in-one solution for the contact center, the enterprise and the cloud, from Interactive Intelligence president and CEO Don Brown, and Tim Passios, senior director, Solutions Marketing.